When presenting PLS’s work Questions For Life (QFL) (featured in my new book) , I am often asked how QFL compares to Bloom’s Taxonomy. My usual response is that I’ll explain QFL and then let you tell me the comparison. My reason is that QFL doesn’t fit into levels of thinking. The categories are not sequential. Patterns of question groupings often emerge though when different types of problem solving, critical thinking, or creativity are tackled. Studying successful people or experts in a particular field will often allow a new learner to discover patterns that the experts are using. This is why a new teacher is interested in what questions an experienced teacher has in mind as she looks at students’ body language during class. ‘Think-Aloud’s in classrooms allow teachers and students to model for others how answers were formed or ideas generated. I found an article by Sam Wineberg and Jack Schneider, Inverting Bloom’s Taxonomy in the Oct 7 2009 (page 28) issue of Education Week that shed some light on my “comparison dilemma”. 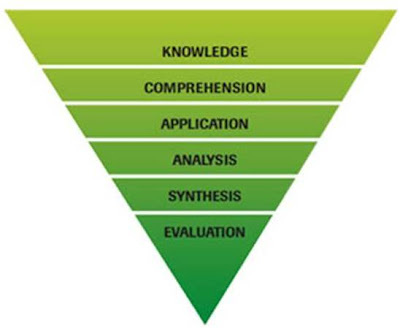 Wineberg and Schneider note that Bloom never used the pyramid with “knowledge as the wide stable base and evaluation as the terrain of intellectual mountaineers” as the explanation of the taxonomy. They suggest turning the pyramid upside down. When and by whom was it written? List the questions you ask yourself when approaching a particular task, label the questions from QFL, and identify any pattern. This is also interesting from the perspective of personality types as discussed in your previous post. Jane A.G.Kise, in her book Differentiated Coaching, discusses E.Murphy’s research and how different personality types will enter Bloom’s Taxonomy at different places based on their type. For instance, Intuitive minds start at analysis and synthesis whereas Sensing minds would start at the knowledge level. Thanks for the addition…it makes a ton of sense..that’s why its important for teachers to examine with a class the multiple approaches to problem solving…Questions for Life can give a language for consciously examining thinking.